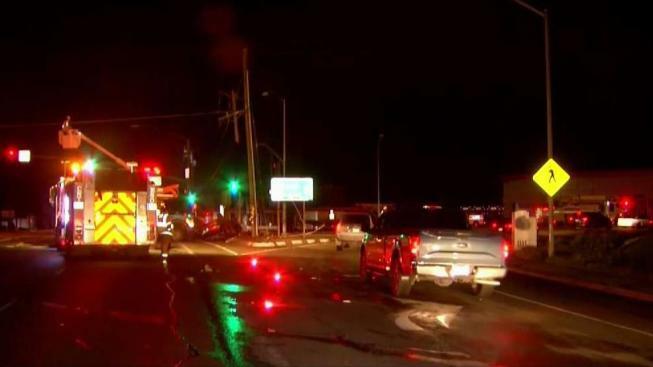 A vehicle slammed into a power pole in Campbell late Sunday, closing down streets and a Highway 17 offramp and possibly causing a power outage for hundreds in the area, according to Campbell police. The crash occurred about 6:30 p.m. on Camden Avenue at White Oaks Road and left power lines down on Camden, police said. The driver suffered minor injuries after the impact caused the vehicle to overturn, police said. Both directions of Camden were shut down as police and emergency personnel arrived at the scene. The roadway was reopened late Sunday night, but the Monday morning commute could be affected as PG&E finishes repairs, police said. No other injuries were reported in the wreck, but power was knocked out for nearly 1,300 customers in the area, PG&E initially reported. The power had been restored to all but 28 customers as of 8:50 p.m. Sunday.